Template for Mendo-Lake Baptist Assn. "To strengthen local churches by enhancing cooperative endeavors through equipping disciples with the leadership and resources necessary to accomplish together what we cannot do as individual churches." The Association aids member churches in these endeavors. Evangelism and missions are the bases of cooperation. The Association of churches has historically used the Baptist Faith and Message as a guideline in credentialing churches seeking membership. the state convention, and the North American Mission Board [NAMB], for training in areas of pastoral leadership, evangelism, discipleship, Vacation Bible School, men's ministries, and women' ministries. These activities are illustrative, and are not limited to only those listed here. The Association holds semi-annual and annual meetings to report cooperative events and to celebrate the ministry works accomplished during the year. This fellowship includes a wider participation than the local churches, for the Association is partnered with other Associations, State and National Conventions, the North American Mission Board, and the International Mission Board. 2. At Camp w/ check made to M-LBA tag: Retreat. 3. At Camp w/ scholarship. I praise you for making the decision to come to this retreat, some of you for the eighth time. Please, as the leading week winds up, take care of business – meaning, clear the tasks you must do by accomplishing them, constructively delaying them, or assigning them to a willing volunteer. Or maybe, just leave some of them in the Lord’s hands. Pastors, on Sunday April 21, during your morning service, please ask your congregation to pray for you and any ministry leaders coming with you. Please spend some meditative time before leaving on Matt. 6:9-15; I suggest spending some pensive chairos moments reflecting on Vv. 12-16 along with your attending ministry leaders. Some advice to digital junkies (personal confession and repentance here): Try to wrap up all your internet/email/twitter/Facebook stuff in the week before. You might even think about leaving all the tech stuff at home, with the exception of your phone. And when you arrive, try turning it off for three days. Yes, I know… some of you will just have to check-in, perhaps a very few of you for an actual good reason. This is a dorm-style camp, so bring a sleeping bag, pillow, towels, shaving kit, and the typical stuff that goes with this kind of event. BE SURE to bring a variety of clothes, including a WARM JACKET. If you require disability quarters: We have limited ‘disability friendly’ accommodations. If you have dietary issues: We try to supply some foods for diabetics, vegetarians, and lactose/gluten intolerant at all meals. If you have such issues, bring your kind of snacks. IF YOU HAVE ANY SERIOUS HEALTH ISSUES, PLEASE NOTIFY US DURING REGISTRATION AT CAMP. WE WILL HAVE A CAMP NURSE FOR ALL THREE DAYS. LET HIM KNOW YOUR ISSUES AND VERIFY YOUR DORM #. Simple directions: Get to Santa Rosa. At the north end of town (almost out of town), turn west on River Road (Hwy. 116). 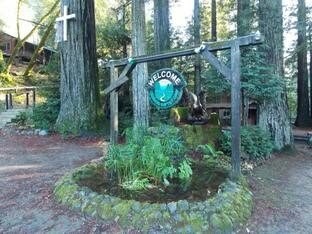 Go through Guerneville and on past Monte Rio (still on Hwy. 116) by about 3 miles. Go over Austin Creek Bridge, turn right immediately on Cazadero Hwy. Go 5.7 miles and look for the volunteer firehouse on right –immediately after, there is a yellow Camp Cazadero sign at 5990 Cazadero Hwy. – turn right over bridge, and right again into camp. Please go directly to registration at dining and get your name tag and dorm #. -Nothing is mandatory - get refreshed!